As a birder, when describing a feature that is pretty much “fixed,” like, say, the proportionately large bill of a Rose-breasted Grosbeak or the red coloration of an adult male cardinal, a cautionary prefix such as “averages” or “in most cases shows” is unnecessary. However, if you’re attempting to describe something that is highly dynamic, for example, the GISS (General Impression of Size and Shape) of a bird, using cautionary prefixes, or ‘cushion terms’ is recommended. Birds manipulate their feathers, which can alter their expected ‘textbook’ appearance; they can puff up, slim down, appear crested or round-headed and anything and everything in between. There’s no better way to appreciate the dynamic appearance of a bird than prolonged, close study. A park bench, spotting scope and a hot cup of coffee comes to mind. Imagine if I were to turn to a beginner birder standing next to me and say “a male Gadwall never shows a smooth, rounded head shape; they always show a steep forehead and a ‘puffy’ rear.” Anyhow, just a small tip while I thought of it! Photo: This male Gadwall’s head shape ‘shape-shifted’ as it cruised across Invista Pond. 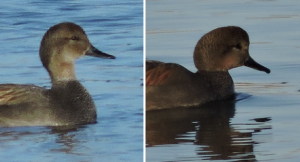 Male Gadwalls have a dynamic range of expressions, ranging from a Barrow’s Goldeneye-esque forehead combined with a puffy rear to the head (at right), to a subdued ‘typical duck’ look (at left). Kingston, Ontario. Winter 2016.